The First Indochina War (generally known as the Indochina War in France, and as the Anti-French Resistance War in Vietnam) began in French Indochina on December 19, 1946, and lasted until July 20, 1954. Fighting between French forces and their Việt Minh opponents in the south dated from September 1945. The conflict pitted a range of forces, including the French Union's French Far East Expeditionary Corps, led by France and supported by Bảo Đại's Vietnamese National Army against the Việt Minh, led by Ho Chi Minh and the People's Army of Vietnam led by Võ Nguyên Giáp. Most of the fighting took place in Tonkin in northern Vietnam, although the conflict engulfed the entire country and also extended into the neighboring French Indochina protectorates of Laos and Cambodia. At the Potsdam Conference in July 1945, the Combined Chiefs of Staff decided that Indochina south of latitude 16° north was to be included in the Southeast Asia Command under British Admiral Mountbatten. Japanese forces located south of that line surrendered to him and those to the north surrendered to Generalissimo Chiang Kai-shek. In September 1945, Chinese forces entered Tonkin, and a small British task force landed at Saigon. The Chinese accepted the Vietnamese government under Ho Chi Minh, then in power in Hanoi. The British refused to do likewise in Saigon, and deferred to the French there from the outset, against the ostensible support of the Việt Minh authorities by American OSS representatives. On V-J Day, September 2, Ho Chi Minh had proclaimed in Hanoi the establishment of the Democratic Republic of Vietnam (DRV). The DRV ruled as the only civil government in all of Vietnam for a period of about 20 days, after the abdication of Emperor Bảo Đại, who had governed under Japanese rule. On 23 September 1945, with the knowledge of the British commander in Saigon, French forces overthrew the local DRV government, and declared French authority restored in Cochinchina. Guerrilla warfare began around Saigon immediately, but the French gradually retook control of the South and North of Indochina. Hô Chi Minh agreed to negotiate the future status of Vietnam, but the talks, held in France, failed to produce a solution. After over one year of latent conflict, all-out war broke out in December 1946 between French and Việt Minh forces as Hô and his government went underground. The French tried to stabilize Indochina by reorganizing it as a Federation of Associated States. In 1949, they put former Emperor Bảo Đại back in power, as the ruler of a newly established State of Vietnam. The first few years of the war involved a low-level rural insurgency against the French. In 1949 the conflict turned into a conventional war between two armies equipped with modern weapons supplied by the United States, China and the Soviet Union. French Union forces included colonial troops from the whole former empire (Moroccan, Algerian, Tunisian, Laotian, Cambodian, and Vietnamese ethnic minorities), French professional troops and units of the French Foreign Legion. The use of metropolitan recruits was forbidden by the government to prevent the war from becoming even more unpopular at home. It was called the "dirty war" (la sale guerre) by leftists in France. The strategy of pushing the Việt Minh into attacking well-defended bases in remote parts of the country at the end of their logistical trails was validated at the Battle of Nà Sản. However, this base was relatively weak because of a lack of concrete and steel. French efforts were made more difficult due to the limited usefulness of armored tanks in a jungle environment, lack of strong air forces for air cover and carpet bombing, and use of foreign recruits from other French colonies (mainly from Algeria, Morocco and even Vietnam). Võ Nguyên Giáp, however, used efficient and novel tactics of direct fire artillery, convoy ambushes and massed anti-aircraft guns to impede land and air supply deliveries together with a strategy based on recruiting a sizable regular army facilitated by wide popular support, a guerrilla warfare doctrine and instruction developed in China, and the use of simple and reliable war material provided by the Soviet Union. This combination proved fatal for the bases' defenses, culminating in a decisive French defeat at the Battle of Dien Bien Phu. In 1941, Ho Chi Minh, seeing communist revolution as the path to freedom, returned to Vietnam and formed the Viet Nam Doc Lap Dong Minh Hoi (League for the Independence of Vietnam), better known as the Việt Minh. Ho created the Việt Minh as an umbrella organization for all the nationalist resistance movements, de-emphasizing his communist social revolutionary background. During the Vietnamese Famine of 1945, Ho Chi Minh blamed ruthless Japanese exploitation and poor weather for up to two million Vietnamese deaths. The Việt Minh arranged a relief effort in the north, winning wide support there as a result. American President Franklin D. Roosevelt and General Joseph Stilwell privately made it clear that France was not to reacquire French Indochina after the war was over. Roosevelt suggested that Chiang Kai-shek place Indochina under Chinese rule; Chiang Kai-shek supposedly replied: "Under no circumstances!" 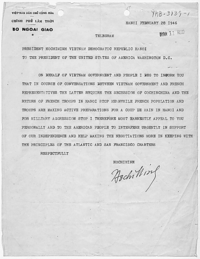 Following Roosevelt's death in April 1945, U.S. resistance to French rule weakened. On August 22, 1945, OSS agents Archimedes Patti and Carleton B. Swift Jr. arrived in Hanoi on a mercy mission to liberate Allied POWs, and were accompanied by French government official Jean Sainteny. The Imperial Japanese Army, being the only force capable of maintaining law and order, remained in power while keeping French colonial troops and Sainteny detained. We hold the truth that all men are created equal, that they are endowed by their Creator with certain unalienable rights, among them life, liberty and the pursuit of happiness. After their surrender, the Japanese Army gave weapons to the Việt Minh. In order to further help the nationalists, the Japanese kept Vichy French officials and military officers imprisoned for a month after the surrender. OSS officers met repeatedly with Ho Chi Minh and other Việt Minh officers during this period. The Việt Minh had recruited more than 600 Japanese soldiers and given them roles to train or command Vietnamese soldiers. 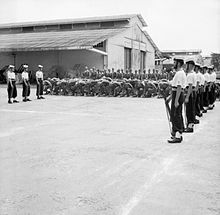 On September 13, 1945, a Franco-British task force landed in Java, main island of the Dutch East Indies (for which independence was being sought by Sukarno), and Saigon, capital of Cochinchina (southern part of French Indochina), both being occupied by the Japanese and ruled by Field Marshal Hisaichi Terauchi, Commander-in-Chief of Japan's Southern Expeditionary Army Group based in Saigon. 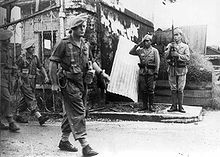 Allied troops in Saigon were an airborne detachment, two British companies of the Indian 20th Infantry Division and the French 5th Colonial Infantry Regiment, with British General Sir Douglas Gracey as supreme commander. The latter proclaimed martial law on September 21. The following night the Franco-British troops took control of Saigon. Almost immediately afterward, as agreed to at the Potsdam Conference (and under Supreme Commander for the Allied Powers' "General Order no. One". ), 200,000 troops of the Chinese 1st Army occupied Indochina as far south as the 16th parallel. They had been sent by Chiang Kai-shek under General Lu Han to accept the surrender of Japanese forces occupying that area, then to supervise the disarming and repatriation of the Japanese Army. This effectively ended Ho Chi Minh's nominal government in Hanoi. Initially, the Chinese kept the French Colonial soldiers interned, with the acquiescence of the Americans. The Chinese used the VNQDĐ, the Vietnamese branch of the Chinese Kuomintang, to increase their influence in Indochina and put pressure on their opponents. On October 9, 1945, General Leclerc arrived in Saigon, accompanied by French Colonel Massu's March Group (Groupement de marche). Leclerc's primary objectives were to restore public order in south Vietnam and to militarize Tonkin (north Vietnam). Secondary objectives were to wait for French backup in view to take back Chinese-occupied Hanoi, then to negotiate with the Việt Minh officials. Chiang Kai-shek threatened the French with war in response to manoeuvering by the French and Ho Chi Minh against each other, forcing them to come to a peace agreement. In February 1946, he also forced the French to surrender and renounce all of their concessions and ports in China, such as Shanghai, in exchange for withdrawing from northern Indochina and allowing French troops to reoccupy the region starting in March 1946. Following this agreement, VNQDĐ forces became vulnerable due to the withdrawal of Chinese forces and were attacked by Việt Minh and French troops. The Việt Minh massacred thousands of VNQDĐ members and other nationalists in a large-scale purge. The British supported the French in fighting the Việt Minh, armed militias from the religious Cao Đài and Hòa Hảo sects, and the Bình Xuyên organized crime groups, which were all individually seeking power in the country and fought the Việt Minh as well. The Việt Minh were militarily ineffective in the first few years of the war and could do little more than harass the French in remote areas of Indochina. The French were backed by the Nung minority while Việt Minh were backed by the Tay minority. In early 1946, the French landed a military force at Haiphong, and negotiations took place about the future for Vietnam as a state within the French Union. Fighting broke out in Haiphong between the Việt Minh government and the French over a conflict of interest in import duty at the port. On November 23, 1946, the French fleet began a naval bombardment of the Vietnamese sections of the city that killed over 6,000 Vietnamese civilians in one afternoon. The Việt Minh quickly agreed to a cease-fire and left the cities. This is known as the Haiphong incident. Major general Thái attacked Đông Khê on September 15. Đông Khê fell on September 18. On January 13, 1951, Giáp moved the 308th and 312th Divisions, made up of over 20,000 men, to attack Vĩnh Yên, 20 miles (32 km) northwest of Hanoi, which was manned by the 6,000-strong 9th Foreign Legion Brigade. The Việt Minh entered a trap. Caught for the first time in the open and actually forced to fight the French head-on, without the ability to quickly hide and retreat, they were mown down by concentrated French artillery and machine gun fire. By January 16, the Battle of Vĩnh Yên ended as Giáp was forced to withdraw, with over 6,000 of his troops killed, 8,000 wounded and 500 captured. Giáp launched yet another attack, the Battle of the Day River, on May 29 with the 304th Division at Phủ Lý, the 308th Division at Ninh Bình, and the main attack delivered by the 320th Division at Phat Diem south of Hanoi. The attacks fared no better and the three divisions lost heavily. Taking advantage of this, de Lattre mounted his counteroffensive against the demoralized Việt Minh, driving them back into the jungle and eliminating the enemy pockets in the Red River Delta by June 18, costing the Việt Minh over 10,000 killed. The operation was a tactical success for the French. However, Giáp, seeing the weakness of the French position, started moving most of his forces from the De Lattre line to Điện Biên Phủ. By mid-December, most of the French and Tai patrols in the hills around the town were wiped out by Việt Minh ambushes. The fight for control of this position would be the longest and hardest battle for the French Far East Expeditionary Corps and would be remembered by the veterans as "57 Days of Hell". By 1954, despite official propaganda presenting the war as a "crusade against communism", the war in Indochina was still growing unpopular with the French public. The political stagnation of the Fourth Republic meant that France was unable to extract itself from the conflict. 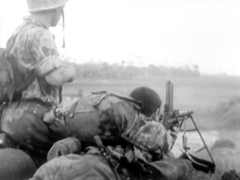 The Battle of Dien Bien Phu occurred in 1954 between Việt Minh forces under Võ Nguyên Giáp, supported by China and the Soviet Union, and the French Union's French Far East Expeditionary Corps, supported by US financing and Indochinese allies. The battle was fought near the village of Điện Biên Phủ in northern Vietnam and became the last major battle between the French and the Vietnamese in the First Indochina War. The battle began on March 13 when a preemptive Việt Minh attack surprised the French with heavy artillery. The artillery damaged both the main and secondary airfields that the French were using to fly in supplies. The only road into Điện Biên Phủ, already difficult to traverse, was also knocked out by Việt Minh forces. With French supply lines interrupted, the French position became untenable, particularly when the advent of the monsoon season made dropping supplies and reinforcements by parachute difficult. With defeat imminent, the French sought to hold on until the opening of the Geneva peace meeting on April 26. The last French offensive took place on May 4, but it was ineffective. The Việt Minh then began to hammer the outpost with newly supplied Soviet Katyusha rockets and other weaponry provided by communist allies. The final fall took two days, May 6 and 7, during which the French fought on but were eventually overrun by a huge frontal assault. General Cogny, based in Hanoi, ordered General de Castries, who was commanding the outpost, to cease fire at 5:30 pm and to destroy all materiél (weapons, transmissions, etc.) to deny their use to the enemy. A formal order was given to not use the white flag so that the action would be considered a ceasefire instead of a surrender. Much of the fighting ended on May 7; however, the ceasefire was not respected on Isabelle, the isolated southern position, where the battle lasted until May 8, 1:00 am. At least 2,200 members of the 20,000-strong French forces died, and another 1,729 were reported missing after the battle, and 11,721 were captured. Of the 50,000 or so Vietnamese soldiers thought to be involved, there were an estimated 4,800 to 8,000 killed and another 9,000–15,000 wounded. 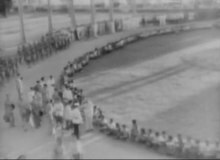 The prisoners taken at Điện Biên Phủ were the greatest number the Việt Minh had ever captured: one-third of the total captured during the entire war. One month after Điện Biên Phủ, the composite Groupe Mobile 100 (GM100) of the French Union forces evacuated the An Khê outpost and was ambushed by a larger Việt Minh force at the Battle of Mang Yang Pass from June 24 to July 17. At the same time, Giap launched some offensives against the delta, but they all failed. The Việt Minh victory at Điện Biên Phủ heavily influenced the outcome of the 1954 Geneva accords that took place on July 21. In August Operation Passage to Freedom began, consisting of the evacuation of Catholic and loyalist Vietnamese civilians from communist North Vietnamese persecution. Today it seems we can be reunited in a will for peace that may express the aspirations of our country ... Since already several years, a compromise peace, a peace negotiated with the opponent seemed to me commanded by the facts, while it commanded, in return, to put back in order our finances, the recovery of our economy and its expansion. Because this war placed on our country an unbearable burden. And here appears today a new and formidable threat: if the Indochina conflict is not resolved — and settled very fast — it is the risk of war, of international war and maybe atomic, that we must foresee. It is because I wanted a better peace that I wanted it earlier, when we had more assets. But even now there is some renouncings or abandons that the situation does not comprise. France does not have to accept and will not accept settlement which would be incompatible with its more vital interests [applauding on certain seats of the Assembly on the left and at the extreme right]. France will remain present in Far-Orient. Neither our allies, nor our opponents must conserve the least doubt on the signification of our determination. A negotiation has been engaged in Geneva ... I have longly studied the report ... consulted the most qualified military and diplomatic experts. My conviction that a pacific settlement of the conflict is possible has been confirmed. A "cease-fire" must henceforth intervene quickly. The government which I will form will fix itself — and will fix to its opponents — a delay of 4 weeks to reach it. We are today on 17th of June. I will present myself before you before the 20th of July ... If no satisfying solution has been reached at this date, you will be freed from the contract which would have tied us together, and my government will give its dismissal to the President of the Republic. The Geneva Accords promised elections in 1956 to determine a national government for a united Vietnam. Neither the United States government nor Ngô Đình Diệm's State of Vietnam signed anything at the 1954 Geneva Conference. With respect to the question of reunification, the non-communist Vietnamese delegation objected strenuously to any division of Vietnam, but lost out when the French accepted the proposal of Việt Minh delegate Phạm Văn Đồng, who proposed that Vietnam eventually be united by elections under the supervision of "local commissions". The United States countered with what became known as the "American Plan", with the support of South Vietnam and the United Kingdom. It provided for unification elections under the supervision of the United Nations, but was rejected by the Soviet delegation. From his home in France, Bảo Đại appointed Ngô Đình Diệm as Prime Minister of South Vietnam. With American support, in 1955 Diem used a referendum to remove the former Emperor and declare himself the president of the Republic of Vietnam. The 1946 Constitution creating the Fourth Republic (1946–1958) made France a Parliamentary republic. Because of the political context, it could find stability only by an alliance between the three dominant parties: the Christian Democratic Popular Republican Movement (MRP), the French Communist Party (PCF) and the socialist French Section of the Workers' International (SFIO). Known as tripartisme, this alliance briefly lasted until the May 1947 crisis, with the expulsion from Paul Ramadier's SFIO government of the PCF ministers, marking the official start of the Cold War in France. This had the effect of weakening the regime, with the two most significant movements of this period, Communism and Gaullism, in opposition. Unlikely alliances had to be made between left- and right-wing parties in order to form a government invested by the National Assembly, resulting in parliamentary instability, with fourteen prime ministers in succession between 1947 and 1954's Battle of Dien Bien Phu. The rapid turnover of governments (there were 17 different governments during the war) left France unable to prosecute the war with any consistent policy, according to veteran General René de Biré (who was a lieutenant at Dien Bien Phu). France was increasingly unable to afford the costly conflict in Indochina and, by 1954, the United States was paying 80% of France's war effort, which was $3,000,000 per day in 1952. A strong anti-war movement came into existence in France driven mostly by the then-powerful French Communist Party (outpowering the socialists) and its young militant associations, major trade unions such as the General Confederation of Labour, and notable leftist intellectuals. 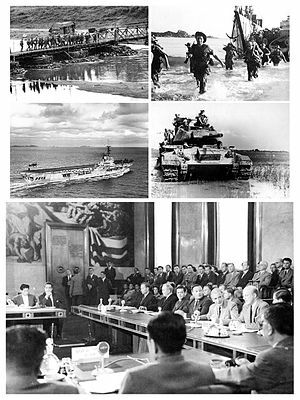 The first occurrence was probably at the National Assembly on March 21, 1947, when the communist deputees refused to back the military credits for Indochina. The following year a pacifist event was organized, the "1st Worldwide Congress of Peace Partisans" (1er Congrès Mondial des Partisans de la Paix, the World Peace Council's predecessor), which took place March 25–28, 1948, in Paris, with the French communist Nobel laureate atomic physicist Frédéric Joliot-Curie as president. Later, on April 28, 1950, Joliot-Curie would be dismissed from the military and civilian Atomic Energy Commission for political reasons. Young communist militants (UJRF) were also accused of sabotage actions like the famous Henri Martin affair and the case of Raymonde Dien, who was jailed one year for having blocked an ammunition train, with the help of other militants, in order to prevent the supply of French forces in Indochina in February 1950. Similar actions against trains occurred in Roanne, Charleville, Marseille, and Paris. Even ammunition sabotage by PCF agents has been reported, such as grenades exploding in the hands of legionaries. These actions became such a cause for concern by 1950 that the French Assembly voted a law against sabotage between March 2–8. At this session tension was so high between politicians that fighting ensued in the assembly following communist deputees' speeches against the Indochinese policy. This month saw the French navy mariner and communist militant Henri Martin arrested by military police and jailed for five years for sabotage and propaganda operations in Toulon's arsenal. On May 5 communist Ministers were dismissed from the government, marking the end of Tripartism. A few months later on November 11, 1950, the French Communist Party leader Maurice Thorez went to Moscow. Some military officers involved in the Revers Report scandal (Rapport Revers) such as Salan were pessimistic about the way the war was being conducted, with multiple political-military scandals all happening during the war, starting with the Generals' Affair (Affaire des Généraux) from September 1949 to November 1950. As a result, General Georges Revers was dismissed in December 1949 and socialist Defense Ministry Jules Moch (SFIO) was brought on court by the National Assembly on November 28, 1950. Emerging media played their role. [clarification needed] The scandal started the commercial success of the first French news magazine, L'Express, created in 1953. The third scandal was financial-political, concerning military corruption, money and arms trading involving both the French Union army and the Việt Minh, known as the Piastres affair. The war ended in 1954 but its sequel started in French Algeria where the French Communist Party played an even stronger role by supplying the National Liberation Front (FLN) rebels with intelligence documents and financial aid. They were called "the suitcase carriers" (les porteurs de valises). In the French news, the Indochina War was presented as a direct continuation of the Korean War, where France had fought: a UN French battalion, incorporated in a U.S. unit in Korea, was later involved in the Battle of Mang Yang Pass of June and July 1954. In an interview taped in May 2004, General Marcel Bigeard (6th BPC) argues that "one of the deepest mistakes done by the French during the war was the propaganda telling you are fighting for Freedom, you are fighting against Communism", hence the sacrifice of volunteers during the climactic battle of Dien Bien Phu. In the latest days of the siege, 652 non-paratrooper soldiers from all army corps from cavalry to infantry to artillery dropped for the first and last time of their life to support their comrades. The Cold War excuse was later used by General Maurice Challe through his famous "Do you want Mers El Kébir and Algiers to become Soviet bases as soon as tomorrow? ", during the Generals' putsch (Algerian War) of 1961, with limited effect though. A few hours after the French Union defeat at Dien Bien Phu in May 1954, United States Secretary of State John Foster Dulles made an official speech depicting the "tragic event" and "its defense for fifty seven days and nights will remain in History as one of the most heroic of all time." Later on, he denounced Chinese aid to the Việt Minh, explained that the United States could not act openly because of international pressure, and concluded with the call to "all concerned nations" concerning the necessity of "a collective defense" against "the communist aggression". The Boudarel Affair. Georges Boudarel was a French communist militant who used brainwashing and torture against French Union POWs in Việt Minh reeducation camps. The French national association of POWs brought Boudarel to court for a war crime charge. Most of the French Union prisoners died in the Việt Minh camps and many POWs from the Vietnamese National Army were missing. Passage to Freedom was a Franco-American operation to evacuate refugees. Loyal Indochinese evacuated to metropolitan France were kept in detention camps. According to Arthur J. Dommen, the Việt Minh assassinated 100,000–150,000 civilians during the war; total civilian deaths are estimated at 400,000. Benjamin Valentino estimates that the French were responsible for 60,000–250,000 civilian deaths. The French Army tortured Việt Minh prisoners. Cat Bay Massacre, 311 Vietnamese civilians were killed by the French Army. Cau Hoa Massacre, 286 Vietnamese civilians were killed by the French Army. By 1946, France headed the French Union. As successive governments had forbidden the sending of metropolitan troops, the French Far East Expeditionary Corps (CEFEO) was created in March 1945. The Union gathered combatants from almost all French territories made of colonies, protectorates and associated states (Madagascar, Senegal, Tunisia, etc.) to fight in French Indochina, which was then occupied by the Japanese. About 325,000 of the 500,000 French troops were Indochinese, almost all of whom were used in conventional units. As a French protectorate, Bizerte, Tunisia, was a major French base. Tunisian troops, mostly RTT (Régiment de Tirailleurs Tunisiens), were sent to Indochina. 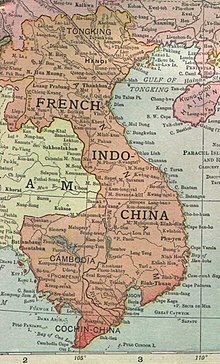 Part of French Indochina, then part of the French Union and later an associated state, Laos fought the communists along with French forces. The role played by Laotian troops in the conflict was depicted by veteran Pierre Schoendoerffer's famous 317th Platoon released in 1964. The French Indochina state of Cambodia played a significant role during the Indochina War through its infantrymen and paratroopers. While Bảo Đại's State of Vietnam (formerly Annam, Tonkin, Cochinchina) had the Vietnamese National Army supporting the French forces, some minorities were trained and organized as regular battalions (mostly infantry tirailleurs) that fought with French forces against the Việt Minh. The Tai Battalion 2 (BT2, 2e Bataillon Thai) is infamous for its desertion during the siege of Dien Bien Phu. Propaganda leaflets written in Tai and French sent by the Việt Minh were found in the deserted positions and trenches. Such deserters were called the Nam Yum rats by Bigeard during the siege, as they hid close to the Nam Yum river during the day and searched at night for supply drops. Another allied minority was the Muong people (Mường). 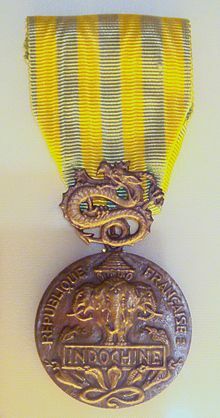 The 1st Muong Battalion (1er Bataillon Muong) was awarded the Croix de guerre des théâtres d'opérations extérieures after the victorious Battle of Vĩnh Yên in 1951. In the 1950s, the French established secret commando groups based on loyal Montagnard ethnic minorities referred to as "partisans" or "maquisards", called the Groupement de Commandos Mixtes Aéroportés (Composite Airborne Commando Group or GCMA), later renamed Groupement Mixte d'Intervention (GMI, or Mixed Intervention Group), directed by the SDECE counter-intelligence service. The SDECE's "Service Action" GCMA used both commando and guerrilla techniques and operated in intelligence and secret missions from 1950 to 1955. Declassified information about the GCMA includes the name of its commander, famous Colonel Roger Trinquier, and a mission on April 30, 1954, when Jedburgh veteran Captain Sassi led the Meo partisans of the GCMA Malo-Servan in Operation Condor during the siege of Dien Bien Phu. In 1951, Adjutant-Chief Vandenberghe from the 6th Colonial Infantry Regiment (6e RIC) created the "Commando Vanden" (aka "Black Tigers", aka "North Vietnam Commando #24") based in Nam Định. Recruits were volunteers from the Thổ people, Nùng people and Miao people. This commando unit wore Việt Minh black uniforms to confuse the enemy and used techniques of the experienced Bo doi (Bộ đội, regular army) and Du Kich (guerrilla unit). Việt Minh prisoners were recruited in POW camps. 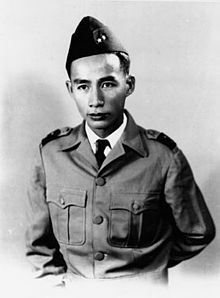 The commando was awarded the Croix de Guerre des TOE with palm in July 1951; however, Vandenberghe was betrayed by a Việt Minh recruit, commander Nguien Tinh Khoi (308th Division's 56th Regiment), who assassinated him (and his Vietnamese fiancée) with external help on the night of January 5, 1952. Coolies and POWs known as PIM (Prisonniers Internés Militaires, which is basically the same as POW) were civilians used by the army as logistical support personnel. During the battle of Dien Bien Phu, coolies were in charge of burying the corpses—during the first days only, after they were abandoned, hence giving off a terrible smell, according to veterans—and they had the dangerous job of gathering supply packets delivered in drop zones while the Việt Minh artillery was firing hard to destroy the crates. The Việt Minh also used thousands of coolies to carry the Chu-Luc (regional units) supplies and ammunition during assaults. The PIM were civilian males old enough to join Bảo Đại's army. They were captured in enemy-controlled villages, and those who refused to join the State of Vietnam's army were considered prisoners or used as coolies to support a given regiment. Many former Imperial Japanese Army soldiers fought with the Việt Minh – perhaps as many as 5,000 volunteered their services throughout the war. These Japanese stayed behind in Indochina soon after World War II concluded in 1945 out of a peak number of 50,000 – the majority of which were repatriated to Japan by the then occupying British. For those that stayed behind, fighting with the Việt Minh became a more attractive idea than returning to a defeated and occupied homeland. In addition the Việt Minh had very little experience in warfare or government so the advice of the Japanese was welcome. Some of the Japanese were ex-Kenpeitai who were wanted for questioning by Allied authorities. Giap arranged for them all to receive Vietnamese citizenship and false identification papers. Some Japanese were captured by the Việt Minh during the last months of the war and were recruited in to their ranks. Most of the Japanese officers who stayed served as military instructors for the Việt Minh forces, most notably at the Quảng Ngãi Army Academy. There were necessary conventional military knowledge such as how to conduct assaults, night attacks, company/battalion level exercises, commanding, tactics, navigation, communications and movements. A few, however, actively led Vietnamese forces into combat. The French also identified eleven Japanese nurses and two doctors working for the Việt Minh in northern Vietnam in 1951. A number of Japanese are remembered at the Yasukuni Shrine as a result of the First Indochina War. 2nd Lieutenant Nakahara Mitsunobu an intelligence officer of the 34th Independent Mixed Brigade; became a decorated soldier in the Việt Minh forces, and later an instructor at the Quảng Ngãi Military Academy. One point that the French had a major problem with was the concept of "sanctuary". So long as the anti-colonial revolutionaries who are fighting a guerrilla war have a sanctuary, in which they can hide out, rest and recuperate after losses and store supplies and necessary material, it is almost impossible and highly unlikely for any foreign enemy or foe to ever destroy and defeat them. During the early 1950s, the southern areas of China, by then under communist rule and allied with the anti-French Việt Minh, was used as a sanctuary by their guerrilla troops. Several hit-and-run ambushes were successfully operated and carried out by the Việt Minh against French Union military convoys along the neighboring Route Coloniale 4 (RC 4) roadway, which was a major supply passage in Tonkin (northern Vietnam). One of the most famous attacks of this nature was the Battle of Cao Bằng. China supplied and provided the Việt Minh guerrilla forces with almost every kind of crucial and important supplies and material required, such as food (including thousands of tonnes of rice), money, medics and medical aid and supplies, arms and weapons (ranging from artillery guns (24 of such were used at the Battle of Dien Bien Phu) to rifles and machine-guns), ammunition and explosives and other types of military equipment, including a large part of war-material captured from the then-recently defeated National Revolutionary Army (NRA) of Chiang Kai-shek's Nationalist Chinese government following the end of the Chinese Civil War in 1949. Evidence of the PRC's secret aid and supplies were found hidden in caves during the French military's Operation Hirondelle in July 1953. 2,000 military advisors from the PRC and the Soviet Union trained the Việt Minh guerrilla forces with the aim of turning it into a full-fledged armed force to fight off their French colonial masters and gain national independence. On top of this, the PRC sent two People's Liberation Army (PLA) artillery battalions to fight at the siege of Dien Bien Phu on May 6, 1954, with one battalion operating the Soviet Katyusha multiple-rocket launcher systems (MRLS) against French forces besieged at Dien Bien Phu's valley. The Soviet Union was the other major ally of the Việt Minh aside from the PRC, supplying GAZ-built trucks, truck engines and motor-parts, fuel, tyres, many different kinds of arms and weapons (including thousands of Škoda-manufactured light machine-guns of Czech origin), all kinds of ammunition (ranging from rifle to machine-gun ammunition), various types of anti-aircraft guns (such as the 37mm air-defense gun) and even cigarettes and tobacco products. During Operation Hirondelle, French Union paratroopers captured and destroyed many tonnes of Soviet-supplied material destined for Việt Minh use in the area of Ky Lua. According to General Giap, the chief military leader of all Việt Minh forces, the Việt Minh used about 400 Soviet-produced GAZ-51 trucks at the Battle of Dien Bien Phu. Because the trucks were concealed and hidden with the use of highly effective camouflage (comprising predominantly of thick vegetation), French Union reconnaissance aircraft were not able to notice them and take note of the effective Việt Minh supply train. On May 6, 1954, during the siege against French forces at the valley at Dien Bien Phu, Soviet-supplied Katyusha MRLS were successfully fielded against French Union military outposts, destroying enemy troop formations and bases and lowering their morale levels. Together with the PRC, the Soviet Union sent up to 2,000 military advisors to provide training to the Việt Minh guerrilla troops and turn it into a fully recognised army. Then the U.S. government gradually began supporting the French in their war effort, primarily through the Mutual Defense Assistance Act, as a means of stabilizing the French Fourth Republic in which the French Communist Party was a significant political force. A dramatic shift occurred in American policy after the victory of Mao Zedong's Communist Party of China in the Chinese Civil War. By 1949, however, the United States became concerned about the spread of communism in Asia, particularly following the end of the Chinese Civil War, and began to strongly support the French as the two countries were bound by the Cold War Mutual Defense Programme. 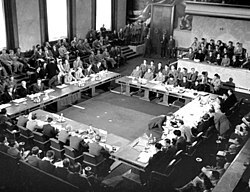 After the Moch–Marshall meeting of September 23, 1950, in Washington, the United States started to support the French Union effort politically, logistically and financially. Officially, US involvement did not include use of armed force. However, recently it has been discovered that undercover (CAT)—or not—US Air Force pilots flew to support the French during Operation Castor in November 1953. Two US pilots were killed in action during the siege at Dien Bien Phu the following year. These facts were declassified and made public more than 50 years after the events, in 2005 during the Légion d'honneur award ceremony by the French ambassador in Washington. USS Windham Bay delivered Grumman F8F Bearcat fighter aircraft to Saigon on January 26, 1951. On March 2 of that year, the United States Navy transferred USS Agenor (ARL-3) (LST 490) to the French Navy in Indochina in accordance with the MAAG-led MAP. Renamed RFS Vulcain (A-656), she was used in Operation Hirondelle in 1953. USS Sitkoh Bay carrier delivered Grumman F8F Bearcat aircraft to Saigon on March 26, 1951. During September 1953, USS Belleau Wood (renamed Bois Belleau) was lent to France and sent to French Indochina to replace the Arromanches. She was used to support delta defenders in the Hạ Long Bay operation in May 1954. In August, she joined the Franco-American evacuation operation called "Passage to Freedom". The same month, the United States delivered additional aircraft, again using USS Windham Bay. On April 18, 1954, during the siege of Dien Bien Phu, USS Saipan delivered 25 Korean War AU-1 Corsair aircraft for use by the French Aeronavale in supporting the besieged garrison. Under the codename Project Swivel Chair, on March 3, 1954, twelve C-119s of the 483rd Troop Carrier Wing ("Packet Rats") based at Ashiya, Japan, were painted with France's insignia and loaned to France with 24 CIA pilots for short-term use. Maintenance was carried out by the US Air Force and airlift operations were commanded by McCarty. Twenty four Central Intelligence Agency (Civil Air Transport) pilots supplied the French Union garrison during the siege of Dien Bien Phu by airlifting paratroopers, ammunition, artillery pieces, tons of barbed wire, medics and other military materiel. With the reducing Drop zone areas, night operations and anti-aircraft artillery assaults, many of the "packets" fell into Việt Minh hands. The CIA pilots completed 682 airdrops under anti-aircraft fire between March 13 and May 6. Two CAT pilots, Wallace Bufford and James B. McGovern, Jr. were killed in action when their Fairchild C-119 Flying Boxcar was shot down on May 6, 1954. On February 25, 2005, the French ambassador to the United States, Jean-David Levitte, awarded the seven remaining CIA pilots the Légion d'honneur. In August 1954, in support to the French navy and the merchant navy, the U.S. Navy launched Operation Passage to Freedom and sent hundreds of ships, including USS Montague, in order to evacuate non-communist—especially Catholic—Vietnamese refugees from North Vietnam following the July 20, 1954, armistice and partition of Vietnam. Up to 1 million Vietnamese civilians were transported from North to South during this period, with around one tenth of that number moving in the opposite direction. The famous Communist propagandist Roman Karmen was in charge of the media exploitation of the battle of Dien Bien Phu. In his documentary, Vietnam (Вьетнам, 1955), he staged the famous scene with the raising of the Việt Minh flag over de Castries' bunker which is similar to the one he staged over the Berlin Reichstag roof during World War II (Берлин, 1945) and the "S"-shaped POW column marching after the battle, where he used the same optical technique he experimented with before when he staged the German prisoners after the Siege of Leningrad (Ленинград в борьбе, 1942) and the Battle of Moscow (Разгром немецких войск под Москвой, 1942). Hollywood made a film about Dien Bien Phu in 1955, Jump into Hell, directed by David Butler and scripted by Irving Wallace, before his fame as a bestselling novelist. Hollywood also made several films about the war, Robert Florey's Rogues' Regiment (1948). Samuel Fuller's China Gate (1957). and James Clavell's Five Gates to Hell (1959). The first French movie about the war, Shock Patrol (Patrouille de Choc) aka Patrol Without Hope (Patrouille Sans Espoir) by Claude Bernard-Aubert, came out in 1956. The French censor cut some violent scenes and made the director change the end of his movie which was seen as "too pessismistic". Léo Joannon's film Fort du Fou (Fort of the Mad) /Outpost in Indochina was released in 1963. Another film was The 317th Platoon (La 317ème Section) was released in 1964, it was directed by Indochina War (and siege of Dien Bien Phu) veteran Pierre Schoendoerffer. Schoendoerffer has since become a media specialist about the Indochina War and has focused his production on realistic war movies. He was cameraman for the army ("Cinematographic Service of the Armies", SCA) during his duty time; moreover, as he had covered the Vietnam War he released The Anderson Platoon, which won the Academy Award for Documentary Feature. A Vietnamese software developer made a first-person-shooter videogame called 7554. Named after the date of Battle of Dien Bien Phu, it commemorates the First Indochina War from the Vietnamese point of view. This page is based on the Wikipedia article First Indochina War; it is used under the Creative Commons Attribution-ShareAlike 3.0 Unported License (CC-BY-SA). You may redistribute it, verbatim or modified, providing that you comply with the terms of the CC-BY-SA.